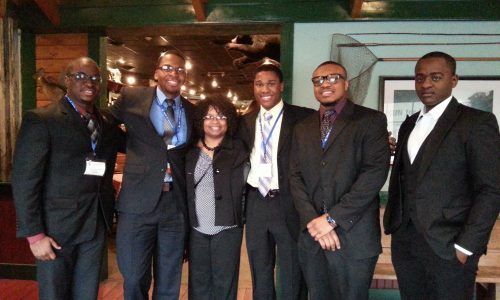 LeQuetia Ancar, ISU NSBE advisor, and ISU NSBE chapter students at 2014 NSBE National Conference. 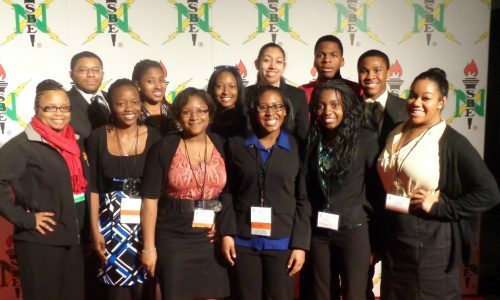 ISU’s National Society of Black Engineers (NSBE) has been awarded the Missouri Zone Outstanding Chapter for 2014 at the NSBE Fall Regional Conference. Augustine Villa, senior in Chemical Engineering, named Cargill Global Scholar. 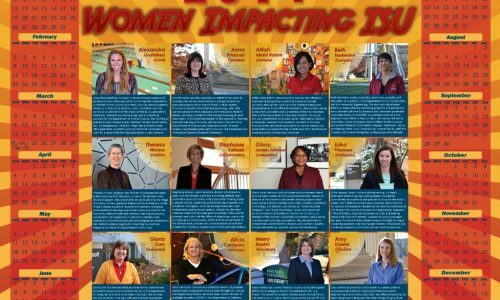 Erika Vaassen, senior in Chemical Engineering, was recognized on the 2014 Women Impacting ISU calendar. Megan Komos, junior in Industrial Engineering, was recognized with the Margaret Sloss Gender Equity Award by the Women’s Center. 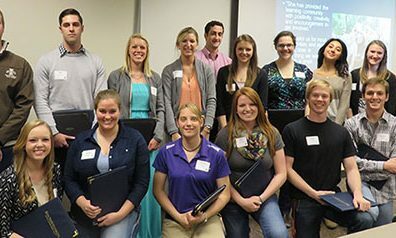 Glenna Lovig, sophomore in Civil Engineering, Katlyn Devoe, sophomore in Agricultural Engineering, and Zoe Eagle, senior in Industrial Engineering, were recognized as Exemplary Peer Mentors, by the Learning Communities Office for 2014. Chloe McPherson, senior in Mechanical Engineering, received the National Society of Black Engineers (NSBE) Board of Corporate Affiliates Scholarship. Christian Miller, senior in Biological Systems Engineer, received NSBE Most Outstanding President in Region 5. Cimone Wright, senior in Computer Engineering, received Alliant Energy/Erroll Davis Jr. Achievement Award. Daisy Isibor, senior in Computer Engineering, Brenda Klutzke, senior in Mechanical Engineering, Samantha Riess, senior in Biological Systems Engineering, and Sarah Weems, senior in Aerospace Engineering, were all named Outstanding Seniors for their departments in the College of Engineering for Spring 2014 semester. Kendra Allen, graduate student in Agricultural and Biosystems Engineering, received the National Society of Black Engineers (NSBE) Board of Corporate Affiliates Scholarship and won the NSBE International Initiative Vanguard Award. Ancar, L., Kennis, A., Williams, D. 2014. Engaged. Connected. Retained: Strategies for Influencing the Success of Multicultural Students. Student Success Summit. Ames, IA, 3 April. Ancar, L., C. Salinas, and D. Williams. 2014. Leveraging Diversity in STEM Teaching: Creating an inclusive classroom: What our latino/a students have to say. CIRTL Network’s Virtual Coffee Hour. Ames, IA, 27 February. Ancar, L., C. Salinas, and D. Williams. 2013. Leveraging Diversity in STEM Teaching: Creating an inclusive classroom: What our men of color have to say. CIRTL Network’s Virtual Coffee Hour. Ames, IA, 24 October.